Waste Less Workshop will take a look at sustainable shopping, alternative transportation and more. Cecelia Warner has been thinking about how to live an environmentally friendly life since she was in grade school. "I'm going to try to not contribute as much as I can to the ruin of the planet," explained Warner, who lives in Forest Grove. "It's a value that I embraced when I was 11." 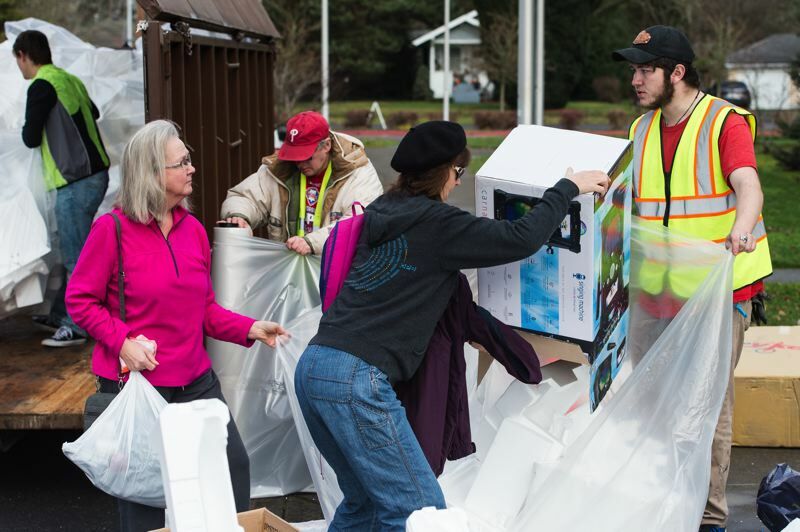 Warner is one of the organizers of PlanetCon, a biannual recycling event where people can turn in items like polystyrene, packing materials, electronics and batteries that often end up in the trash. On Saturday, Feb. 9, Warner and Stephanie Minshall will share their advice as Master Recyclers about living "green" year-round. Their "Waste Less Workshop" will be presented in the Rogers Room at the Forest Grove City Library, 2114 Pacific Ave., from 1 to 2:30 p.m.
"We are going to be getting into depth about how you can ground yourself in your life, your home, your family, with products that create less waste," Warner said, "either when you buy them, or when you're done with them." Warner is a big proponent of buying or creating alternatives to plastic, with materials like glass and metal that are durable and recyclable. "I'm probably going to pick on plastic a lot," she laughed. Warner added, "I do know that it does serve a very specific and important purpose on the planet. I have an artificial knee with a plastic part in it." But she continued: "I think it's just become so invasive in our food and in packaging. … Now that we have this issue with our plastics being recycled by China … we really don't have that 'out of mind, out of sight' option anymore, where we put it in our recycling bin and it goes away and we don't ever think about it again." In 2017, the Chinese government abruptly announced it would no longer accept much of the plastic that it had been purchasing for years from places like the United States. It then announced last year that it would sharply restrict scrap metal imports starting this July, with a goal toward banning all solid waste from foreign countries. China was the world's largest recycling market, and the new policy has left no obvious solution to fill the void. As a result, experts say, much of the plastic waste that would have been recycled in China is now ending up in landfills or incinerators. Warner and Minshall's workshop will also touch on cleaning products, cosmetics and other items that have more environmentally conscious alternatives. Warner also wants to talk about lifestyle choices, like bicycling and taking mass transit instead of driving. While Warner enjoys educating people about sustainable living, she said her goal is for Saturday's event to be more of a dialogue than a lecture. "We're also hoping that the participants can bring their own ideas … to share with us," Warner said. Among those ideas that Warner wants to discuss is how to accommodate people who cannot easily afford to buy a "green" option instead of something cheaper but less eco-friendly. "We want environmentalism to be just, as well," Warner said. Both environmentalists and scientific experts have been sounding the alarms for years about the effects of resource depletion — deforestation, overfishing, strip-mining and fracking, among others — and unchecked burning of so-called fossil fuels like oil, coal and natural gas. Climate modeling suggests that the Earth's atmosphere and oceans will keep getting warmer, due in large part to greenhouse gas emissions caused by human activity, with potentially catastrophic effects. Experts argue that in order to slow or stop global warming, sweeping policy changes are needed at a global level to curb emissions. For her part, Warner is a believer in the philosophy that individuals should do their part as well. "Leaving the Earth in a better state, in a better condition, than when you came on it would be a very good thing, but (it is) very difficult to do in this day and age. So we're actually hoping to roll back time to before the '50s, when people did things more self-sufficiently," Warner said. She concluded, "We're trying to be realistic, but if we set idealistic goals and we get there only halfway — hey, that's something."